In the bowl of a stand mixer, combine flour and salt. Make a well in the center and pour in warm water, sugar and yeast, and let stand until foamy, about 5 minutes. Then, pour in olive oil, mix until just combined and then knead with the dough hook attachment or by hand on a lightly floured counter for about 5 minutes, until dough is smooth and elastic. Place dough in a bowl lightly covered in olive oil, roll the dough around to cover it in oil, cover the bowl with plastic wrap or a tea towel and let dough rise until doubled, about 1 1/2 hours. Once dough is risen, preheat oven to desired temperature (300°F to 325°F for hard, crunchy breadsticks; 400°F to 425°F for soft, chewy breadsticks). Using a rolling pin, roll out dough into a rectangle shape to desired thickness. Using a pizza cutter, slice dough into breadstick shapes (see photo above for example). If you want toppings, lightly spray the breadsticks with water and sprinkle with toppings. You can leave the breadsticks as is (which is what I did), or you can stretch out the breadsticks to make them longer, or twist them into shapes. Once shaped, place them on a baking stone or parchment paper-lined baking sheet and bake until crispy (if desired) or just until golden brown (if you want soft breadsticks). If you haven’t had the pleasure of baking yourself a batch of homemade breadsticks, now is the time. Not only is it insanely easy, they’re immensely more flavorful and delicious than the ones wrapped up between the dinner rolls at restaurants. When I first planned to make these Everything Breadsticks, they were supposed to be those long, round, soft breadsticks, the kind that almost melt in your mouth after they’re pulled straight from the oven. Instead, I ended up with a unique batch of semi-long, flat, crunchy-soft breadsticks. It’s not that I’m disappointed, but the experiment didn’t really turn out as planned. Still, they are mighty tasty. There’s a hint of crunch and chew in every bite, and the seeded topping gives it almost a bagel-y, rye bread-like flavor. Hard to explain, I know. You’ll just have to try them for yourself to understand what I mean. 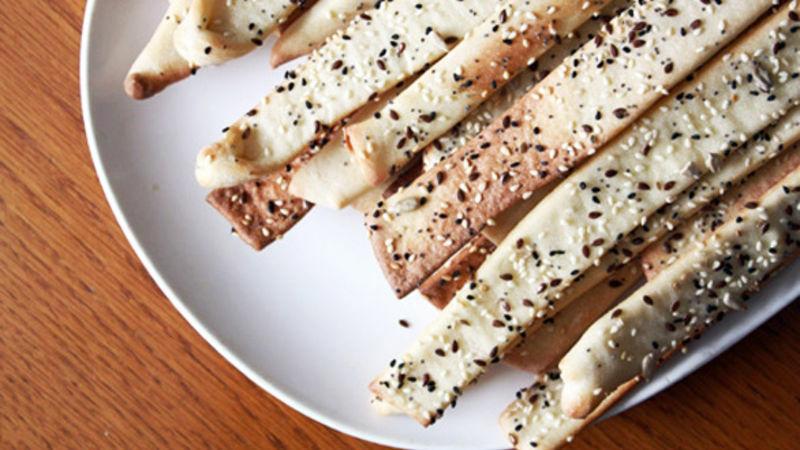 If you’re not into the whole “everything” seeded/semi-long/flat/crunchy-soft version of breadsticks, you can make them round, soft and covered in garlic salt or cheese – like those at a certain popular Italian restaurant. This recipe is flexible like that. Just bear in mind: even if they don’t turn out the way you initially wanted them to, they still might be perfect for you – as is the case with most things in life.